The Oblates purchased the Wilson Farm on the Lowell Road in 1922 and established a novitiate for young men entering the priest hood. The initial wooden building burned in 1935 and was replaced by this brick building in 1936. The novitiate closed and the building was used as a retreat house beginning about 1941. Many religious based retreats were held here for religious leaders, lay persons, teens, and individuals with special needs. A large lecture hall and chapel were added later. In the first photo we see the Oblate Retreat House as it appeared in 1976. 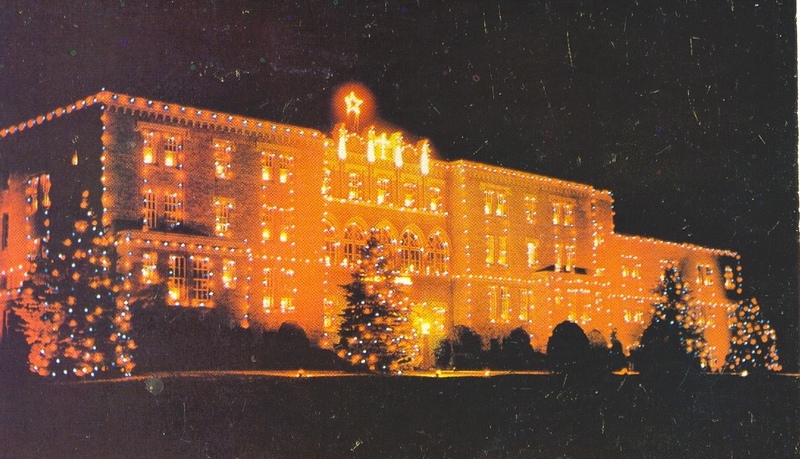 Some of our readers may recall attending a weekly or weekend retreat at the OMI (Oblates of Mary Immaculate) Retreat House; many more will remember the magnificent display of Christmas lights as early as 1952. In 1960 as many as 300,000 lights were used in the special display which caused a glow in the sky for many to see! Travelers were lined up and down Lowell Road to catch a look at the display which was visible from the road. The second photo shows one of these exhibits. These exhibits left fond memories with many residents; the magnificent displays on the building and grounds and the enchanted village inside. All open to the public. Local residents remember, and miss, the friendly, welcoming atmosphere extended by the brothers of OMI to the kids and families living in the area. Hudson resident Leo Demers and his childhood friend Fran would spend summer/winter days helping the resident brothers and priests with chores such as weeding, raking and general clean-up, decorating for Christmas. For this they were paid a dish of ice-cream!! After the retreat house closed the property was placed in a holding company and purchased by Etchstone Properties in 2005. This building and the acres around it are now the location of Mission Pointe, residences for age 60+, at 200 Lowell Road. The Oblate of Mary Immaculate were one of 3 religious organizations who purchased large pieces of farmland along Lowell Road; using the property in their own mission, keeping fields/forests maintained and unused for commercial purposes. Photo from the collection of the Hudson Historical Society. Published HLN June 12, 2015. By Ruth M Parker in Lowell Road on June 12, 2015 .